The new double lane boat ramp is located upstream of the existing pontoon jetty and will be constructed on sleeved steel pile footings supporting precast concrete beams and slabs. On completion of the boat ramp, Council will then enlarge and upgrade the carpark, access road and launching area. Improved lighting and signage is also included in the scope of works. The old boat ramp will be retained for launching of non-powered personal watercraft such as canoes, kayaks and windsurfers. The project is being jointly funded by Bega Valley Shire Council and Transport for NSW under the NSW Boating Now Program. 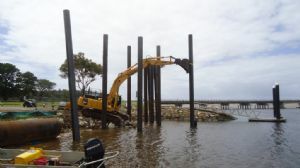 “The Upgrade Project will replace an older facility of limited capacity with a new two lane boat ramp, upgraded carparking and associated works that will better cater for the significant usage Mogareeka receives from the local community and visitors,” Group Manager for Transport and Utility Services, Wayne Sartori said. The boat ramp construction will take approximately 10 weeks, and the carpark upgrade and associated works will take approximately six weeks. The existing boat ramp will remain operational throughout the construction period. Photograph: Steel piles being positioned prior to being driven into the river bed to provide footings for the new boat ramp.